Get more out of your door with a bold adhesive door edge label. Our EdgeAlert™ laminated vinyl labels feature a high-bonding adhesive that easily sticks to any emergency door edge, so you can display a vital safety message where it matters the most. 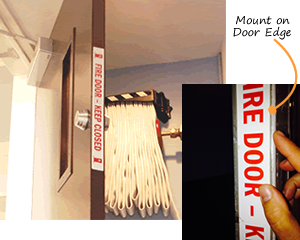 Great for fire exits and other important passageways, you can even split your label in half to adhere to double doors. • Each label pack features five labels with your message, so you can use them in multiple locations, in addition to your door edges. These labels are 17" x 1.25". • Our EdgeAlert™ laminated vinyl labels resist moisture and abrasion, for a longer-lasting message. • Our EdgeAlert™ labels are specially designed to fit on your door edge. You can reinforce your message on walls, landings, and doors to give vital safety instructions at every point of egress. Magnet fits over the latch and prevents the door from locking.